"This is the story, not of Christ, but of Christianity. The story of a religion that starts as a tiny Jerusalem sect, and goes on to triumph over the world." Arts & Entertainment originally aired the documentary series Christianity: The First Two Thousand Years as an eight-part series. The first four segments aired in 1998, covering the first millennium of the Christian faith, followed by another four episodes in 2000, covering the events of the second. The title alone implies a massive undertaking—a survey of a major world religion covering two thousand years of history—and the series originally ran for eight broadcast hours. Trimmed to eliminate commercial breaks and redundant credits, and (sometimes clumsily) edited into two continuous pieces, one per disc, Christianity: The First Thousand Years and Christianity: The Second Thousand Years still runs a good six hours. Each three-hour chunk is still a lot to digest, and viewers may prefer to watch six chapters at a time, mirroring the original episode breakdown. Fortunately, the program's densely-packed narrative is rich with fascinating, often surprising information. Beginning in the days immediately following the crucifixion of Jesus Christ, the series traces the history of the early church, including the conversion of Saul of Tarsus, the politics and evangelism of the time, the eventual split with Judaism (over Christians' selective enforcement of God's Law, not messianic issues), and the new religion's appeal to those who were beginning to abandon the "old" Greek and Roman gods. The Roman backlash against the Christians, in the form of crucifixions, beheadings, burnings and gruesome coliseum spectacles, is traced to Nero's finger-pointing at "Christian arsonists," after a major fire decimates Rome; the faith's assimilation into Roman culture leads to adoption of a Bishop-centric structure, and the demotion of the women who, until that time, had played significant leadership roles in the Christian faith. The hasty editing of the official "New Testament" under Constantine eliminates numerous controversial books (the Gnostic Gospels and others), and monks establish a new, ascetic manner of expressing one's faith. Irish monks defy the druids and establish a Celtic Christianity, also preserving classical culture by manually transcribing surviving Greek and Roman works in the 5th century. Orthodoxy clashes with faith-based factionalism, Islam rises and grows to dominate the Middle East, and Charlemagne helps to establish the power structure of the Catholic church as we know it. Lustful popes betray their holy orders, the Crusades create carnage in the name of the Church, and fears of heresy lead to the Inquisition, which reaches its most virulent power in the newly united Spain. Pope Gregory imposes celibacy on the priesthood, destroying many happy marriages, the Church's power and corruption is challenged by Martin Luther's Ninety-Five Theses, and the Protestant church is established by Henry VIII. Gutenberg's printing press brings the Bible to the masses, dissipating clerics' monopoly on The Word. The church in England establishes new modes of relevance to contemporary life under such innovators as John Calvin and John Wesley. The United States becomes a heavily Christian, yet religiously tolerant, new country, and the church continues to influence public thinking on topics such as civil rights, charity and "family values." The series is inevitably limited in terms of production value—the story of Christianity only calls for so many animated maps, and the visuals are dominated by motion-control camera moves over artwork, video interviews with theologians and historians, travelogue-style shots of landmarks and holy places, and stock footage of knights, monks, and itinerant preachers. The final segments incorporate archival footage of Billy Graham, Martin Luther King, Pope John Paul and others, but the multimedia era doesn't overlap much of the timeline covered here. Well-scripted narration by Ossie Davis and Dorian Harewood is augmented by historical readings by Ruby Dee and Gloria Foster, providing for a more interesting audio experience, but the program's tone is fairly dry. Still, it's a very informative production, and a valuable one. Its secular orientation allows it to be more honest than most "Christian" documentaries without being disrespectful of its subject. Rather than directing our attention solely to inspiring stories of individual faith, the filmmakers also acknowledge the evil that humans have perpetrated in the name of Christ. The perspective provided by this comprehensive survey is especially valuable in the United States of 2001, as fears of Islam and mindless patriotic invocations of God threaten to undermine our tolerance, devalue our true beliefs and ultimately compromise our freedom. 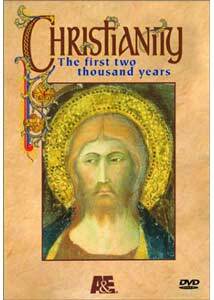 Taken in small chunks for maximum enjoyment and edification, Christianity: The First Two Thousand Years is a significant and important documentary about God, faith and human nature. Recommended. Image Transfer Review: A&E presents Christianity: The First Two Thousand Years in its original 1.33:1 full-frame aspect ratio, as produced for television. The transfer is taken from an analog videotape master, and suffers from a considerable degree of edge enhancement, scan-line shimmer, smeariness on fine detail and red/blue false-color aliasing. A number of shots were apparently edited using MPEG-1 compression, with a low-resolution, blocky "digital" look, and several scenes exhibit very odd interlacing artifacts, as though the even and odd scan lines are slightly out of step. There are even some videotape glitches, black lines and "warbles" that indicate issues with the master. It's adequately transferred to DVD, and none of the image defects interfere with the information presented, but it's a slightly below-average presentation. Audio Transfer Review: The DVD transfer retains the production's original audio, presented in Dolby 2.0 Surround format. The presentation is straightforward, with narration in the center channel and music spread out through the five channels. The audio quality is quite good, with crisp voice-overs and very nice music reproduction; there's even some substantial bass content in a few spots. A simple but very solid audio presentation. Extras Review: A&E supports Christianity: The First Two Thousand Years with 48 picture-menu chapter stops (6 per original episode of the series) and few supplements, not surprising given the documentary nature of the primary content. Extras include a Millennium Timeline, two simple still-frame diagrams depicting the sequence of key events covered by each disc; a screen of DVD Credits on each disc; and a Closed Captions screen, directing viewers to the encoded captions (apparently in lieu of subtitles). There's nothing here to expand on the scope of the main attraction, but no further explication is really necessary. Christianity: The First Two Thousand Years devotes six hours to its sprawling subject, painting a fairly detailed picture of a faith that has undergone many changes and evolutions over two millennia. The tone is fairly dry, and it's easier to digest the dense material in multiple sittings, but this ambitious documentary project generally succeeds. A&E's 2-disc DVD set features a middling transfer and few extras, but history students, theologians and curious Christians will find the material fascinating.